My husband gifted me at Christmas with a beautiful wooden memory box you handcrafted. It is exquisite and is perfect for storing the letters, cards, and drawings I received from the school children I taught during my 36 year career. Finally, I was able to get those special papers out of ragged manila envelopes! I am so pleased with the smoothness of the box's finish and the detail given to its design. The addition of the trays was a great idea! They helped me divide the early years from the more recent ones. Your woodwork has received many compliments from visitors to our home. Thank you for collaborating with my husband to prepare this very special gift that is filled with many wonderful memories. forever. Thank you for your time and effort to make such a beautiful piece of art. There aren't many people that have the God given talent that you do. Continue to use that talent to make people happy. I am sure my wife will be contacting you after Christmas day to express her appreciation. I wish you and your family a Merry Christmas. 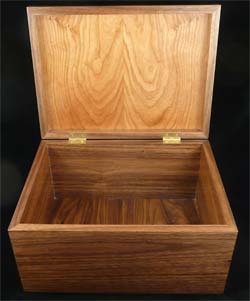 The custom mitered box is made from black walnut with a cherry accent at the bottom with a top panel made from cherry. 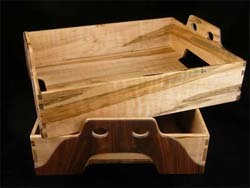 The two removeable trays are made of ambrosia maple and walnut. The box bottom is a solid black walnut panel. Solid brass box hinges were used that hold the lid open just past vertical. 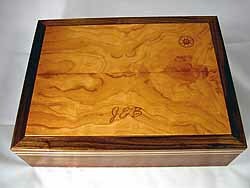 The box was finished with General Finishes Arm-R-Seal which is a combination of tung oil and polyurethane. The memory box arrived and it is even more lovely than I had imagined. From the symbolism in the grain of the cherry wood, to the precision of the construction and the luster of the finish, it is perfect. Our son and his wife are so grateful to have such a beautiful and meaningful place to hold the mementos of the son they lost. This box is sure to become a cherished family heirloom. 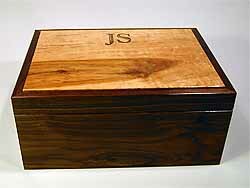 The custom mitered box is made from 1/2" black walnut with a top panel made from cherry. The box bottom is a solid 1/4" black walnut panel. Solid brass box hinges were used that hold the lid open just past vertical. 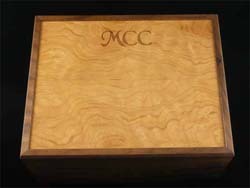 The box was finished with General Finishes Arm-R-Seal which is a combination of tung oil and polyurethane. 1 week. I gave it a try. You were so helpful over the phone describing in detail what your ideas were. And me, being a non-wood person, you were so patient with me while I attempted to describe my ideas. You kept me constantly contacted throughout the process (with pictures along the way) and expedited delivery so I could present to him at dinner. When I received it that morning, I was in complete awe. I have to say, it was so beautiful, so special I was actually embarrassed about giving it to him. It honestly was too good! I was embarrassed about giving to him in a crowd (go figure he hates the spotlight) so while at dinner that night - he forgot about his 5 year anniversary - I explained that I had something really good to give him and he might freak out. I took out the ball and put it on the table. He looked at it, saw the "TelePacific" logo and turned around and saw his face etched in wood. I said open it. And as he took the balls out he just mumbled something like "how did you..." and kept opening. For the first time since I've known the man he was speechless (which frankly I would have paid double for but that's another story). He was so grateful. He said he was going to keep it in the office to show some folks but it would end up in his bookcase because it was "too special". I can't thank you enough for having the ability to show him how much I respect and admire him. I've already thought of other ideas for you but unfortunately my boss is keeping me too busy! The nested spheres were provided by the customer. She indicated that they were made in Russia from Linden wood. 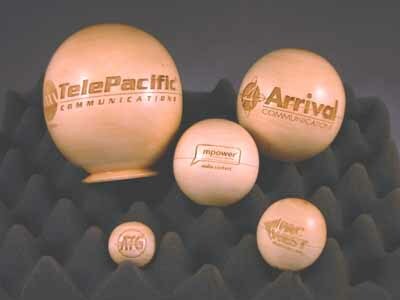 Laser engraving a sphere required the construction of a special facility. The laser engraver had to hold a sphere securely and rotate it while engraving. 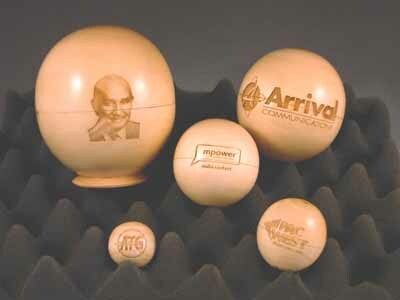 This required substantial setup work since few, if any, laser engravers are set up to handle engraving spheres. It was further complicated in that there was no way to test the engraving on this particular wood. Despite the complexities and rushed schedule it all worked out with another happy customer. special character of the Folk School. It is perfect - thank you!" 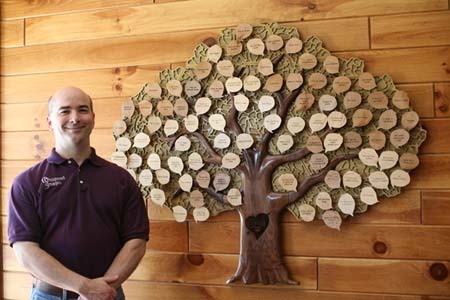 This Tree of Life donor recognition tree was created as a commission for the John C. Campbell Folk School's new Willard Baxter Woodturning Studio. The folk school is located in Brasstown, NC and was founded in 1925. 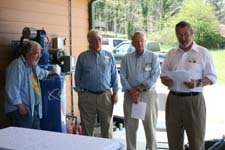 The woodturning studio was opened in January 2007 and dedicated on April 21, 2007. 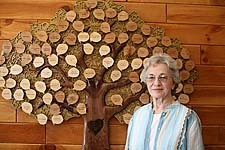 The donor recognition tree is made entirely from five varieties of wood - walnut, poplar, maple, river birch and oak. The background canopy of the tree is made from poplar with a solid poplar backing and laser cut patterns made to represent background foliage. The hand carved trunk and limbs are made from black walnut. The leaves are made from regular and figured river birch as well as regular and curly maple and are mounted to the tree using oak dowels. The leaves were laser cut and laser engraved with the names of all the wonderful people and organizations that donated resources to building the studio. The donor tree was created with eighty eight leaves, but has room for more to be added as needed. The trunk of the tree features the John C. Campbell Folk School logo inside a heart. 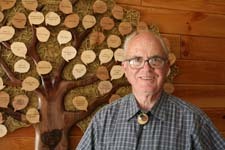 Reminiscent of lover's initials carved on a tree, the heart and logo symbolize the great love these donors have for the folk school and for Willard Baxter. As with most of our work this project was finished entirely with Arm-R-Seal Oil and Urethane finishes. This completed tree is approximately forty two inches tall and fifty two inches wide. The same design concept can be used to create larger, smaller and themed, custom donor recognition projects. This tree of life was designed, created and delivered in less than thirty days. A sample of pictures from the dedication. "WHAT TO GET THE HUSBAND OF 18 YEARS AND WHO NEEDS NOTHING"? Well, I can honestly say Whispered Images is the answer. They came along just in time to save my husband from receiving gifts that he didn't need or more of the same old things. They took my ideas and turned them into a very unique Christmas Present and a cherished Birthday Present. The teak wooden sign was engraved with the name of his newly purchased sailboat. They helped to personalize it with nautical themes and all of our dock friends want one too. The engraved man's valet was created from a variety of beautiful rich tone woods and the sailor's compass rose was an added enhancement. So thank you Whispered Images for giving me the satisfaction of surprising a wonderful husband with two unforgettable gifts. I can't wait to surprise the next loved one with one of your creations. The sign was made from 4/4 solid teak with stainless steel eyelets. The sailboat and compass rose images were custom designed and the lettering font was selected based on the Sheila's original request. It was finished with several coats of Tung Oil. 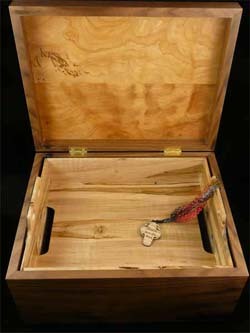 The mitered box used as a covered valet is made from walnut with a padauk and maple accent. The top is made from river birch specifically chosen for the grain pattern reminiscent of an old world nautical map. The box was finished with General Finishes Arm-R-Seal because the tung oil brings out the colors in the wood and the urethane provides a hard, long-lasting protective seal to keep it looking like new. I was familiar with Whispered Images work and had thought that their products were beautiful. 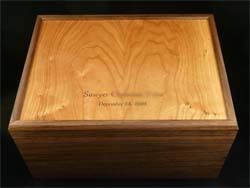 I placed an order for a memory box for my grandson as a birthday gift. I gave a very vague description of how I wanted the box made and the price range I wanted to stay within. When I received the finished box it was unbelievably beautiful. The detail of the wood was so perfectly highlighed and so perfectly finished. The inscriptions that I had ordered for the box were perfect, beautifully done, not overbearing, just perfect. Whispered Images are true artists, reminiscent of the way things used to be made, with meaning and love for their art. If you are looking for a special gift with meaning, something that will last a lifetime and hold special memories, Whispered Images is the only place you need to look. 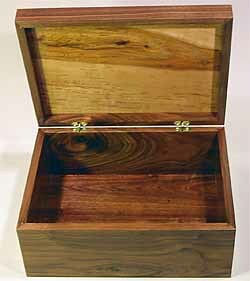 The custom mitered box is made from 1/2" black walnut with a 1/2" inset floating top panel made from river birch. 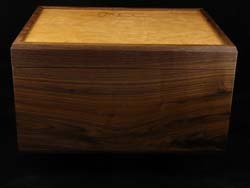 The corners of the box are splined with matching black walnut. 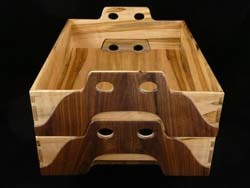 The box bottom is a solid 1/4" black walnut floating panel. The hidden hinges are made by Soss Hinge. The box was finished with General Finishes Arm-R-Seal which is a combination of tung oil and polyurethane.